These four stories, along with 14 other pieces, have one thing in common: They're short, sharp, and to the point - science fiction in miniature, with none of the stories longer than 2,300 words. But in that short space exist entire universes, absurd situations, and the sort of futuristic humor that propelled Scalzi to a Hugo with his novel Redshirts. Not to mention yogurt taking over the world (as it would). Spanning the years from 1991 to 2016, this collection is a quarter century of Scalzi at his briefest and best and features four never-before-published stories exclusive to this collection: "Morning Announcements at the Lucas Interspecies School for Troubled Youth", "Your Smart Appliances Talk About You Behind Your Back", "Important Holidays on Gronghu", and "The AI Are Absolutely Positively Without a Doubt Not Here to End Humanity, Honest". John Scalzi is the New York Times best-selling author of Old Man's War, Lock In, and Redshirts, among others. His work has won the Hugo and Locus Awards and been nominated for the Nebula and Campbell Awards. He lives in Ohio and online. He enjoys pie. Full cast of narrators includes Oliver Wyman, Dina Pearlman, and Allyson Johnson. ©2016 John Scalzi (P)2016 Audible, Inc.
1) Do you like short and "laugh out loud" science fiction? 2) Do you wonder what human interaction with aliens on a daily basis in school or in the workplace would be like? 3) Do you find the idea of human annihilation by AI or an intelligent Randian Yogurt possibly funny? 4) Does the idea of security risk assessment regarding spaceship travels or super heroes/villains amuse you? 5) All of the above? Obs: if you like this, get "Redshirts" and/or "Fuzzy Nation"
I laughed hard enough that strangers asked me if I was all right. It was the Janissaries. Great variety of stories, with intros by author. What did you love best about Miniatures? What was one of the most memorable moments of Miniatures? Hard to choose because each of the stories is so unique. My favorite is 'Denise Jones, Superbooker'. OMG!! So hilarious! The last 'story', though, is a poem he wrote to Penelope (wife of Odysseus), which is extremely sweet. Very touching. So many characters, so many voices.... The kids in the Lemonade story had the perfect whiny tones. Ha! Not necessary because the stories are so short, but I did want to because it was so entertaining. Could not have asked for a more enjoyable two+ hours of entertainment. 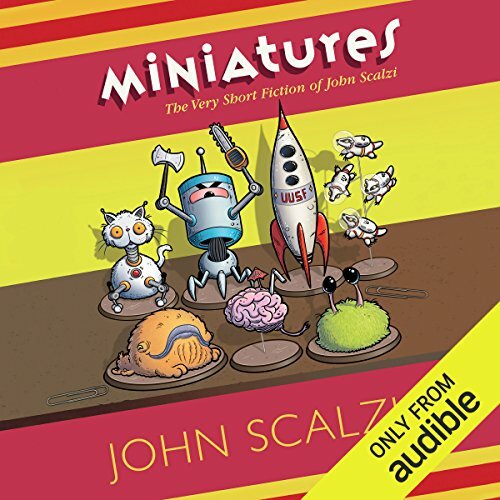 If you like Scalzi's work, this is a must-have. A hilarious compilation of short sci-fi stories that has a little for everyone: Star Trek fans, Star Wars fans, pet lovers, teachers, corporate employees and diplomats. I enjoyed the format and the stories told. For such short stories, he covered some detailed material. It was a nice break between my longer reads. This collection of short stories had me laughing! These clever little snippets are sure to brighten your day. Incredible science fiction. It amazed me! It was humorous, amusing, and thought-provoking. I recommend it to people who enjoy a bit of sarcastic humor, but if does go low-brow occasionally. If you only have 15-20min here and there to listen, this is an enjoyable way to do it. Scalzi is one of my favorite authors and being able to listen to him in short bursts is great. I enjoyed Red Shirts, but just struggled through these shorts. These felt more like snippets or notes for novel scenes than short stories. I guess the title should have been a tipoff, but I assumed these were more finished pieces than they were. Das besondere an dieser Audio-Sammlung sind die Einführungen vom Author selbst: man erfährt von ihm einiges an Hintergrund zu den Geschichten, die aus allen Perioden seines bisherigen Schaffens stammen. Jede ist anders und wird auch von jemand anderem vorgetragen. Manche sind einfach brillant, die meisten sind sehr gut und nur bei einer war Scalzi's einführende Warnung zutreffend. Die letzte der Geschichten, ein erster Versuch aus der Highschool-Zeit, hätte er sich sparen können. Aber wie sagt er selbst: keine Angst, keine dauert lang..